John Coldwell, b: Jan 21, 1864 d: March 27, 1927 lived his life at Cass Siding / Jules, just West of Shiloh Cumberland Presbyterian Church. John had the following siblings: Patrick Henry Caldwell, b: Feb 17, 1862, d: April 27, 1904: Charles Edward, b: Oct, 27, 1866, d: August 13, 1867: Emma Cecila b: July 4, 1868: Mary Jane, b: March 10, 1871; Elizabeth, b: July 16, 1874, d: August 31, 1955: Catherine Caldwell, b: Aug 29, 1875 and Charles Edward, b: Oct 27, 1877, d: 1952. 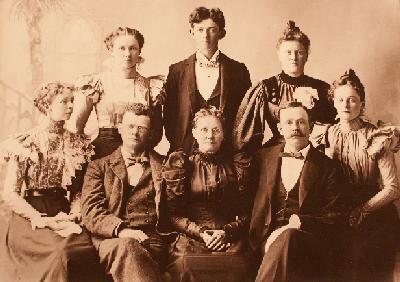 In the family picture above, taken circa 1893, there are, in the front row (from left), Patrick Henry, Catherine Heaton Caldwell and John. In the back row, (from left), Elizabeth (seated), Emma Cecila, Charles Edward, Catherine and, Mary Jane. With the loss of his father, Charles Caldwell, in 1878, John became the man of the house at age 14, helping his mother, Catherine Heaton Caldwell, in running the family farm. Starting around 1894 and until his death, John operated the grain elevator at Cass Siding for the Schultz Baujan grain mill of Beardstown. He also operated a general store at that location until 1923. He closed it, he said, when the advent of the paved highway and automobiles made it too easy for thieves to make off with large quantities of goods. Katherine was a daughter of John Isaac Nix, b: Apr 4, 1847, d: Jan 10, 1934, a Civil War veteran who, in later years was a barber in Ashland. She was born Feb 24, 1874 and died March 11, 1927 at St. John’s hospital in Springfield during gall bladder surgery. John passed away two weeks later, the stress of losing his beloved companion undoubtedly aggravating his existing heart condition. Katherine’s mother was Ellen Frances McGeehee of Mason County, IL. John’s father was Charles Caldwell, b: July 10, 1836 in Mt. Savage, MD d: Oct 25, 1878 in Cass County. John’s mother was Catherine Heaton, b: Oct 18, 1844 in Manchester England, d: 1919. Charles’s father, John’s grandfather, was Patrick Lewis Caldwell, b: 1810 d: April 23, 1878. Patrick came to the United States via the port of Baltimore in 1835 with his wife-to-be, Mary Ann Reynolds from County Monaghan, Ireland. They were married shortly after their arrival and, soon after the birth of their son, Charles, in Mount Savage, Maryland, moved on to Cass County, Illinois where they resided the rest of their lives. It should be noted that John preferred spelling his last name Coldwell rather than Caldwell, but both spellings are found on various documents. His grandfather, Patrick’s tombstone has the name spelled Cauldwell, in the old Irish way.